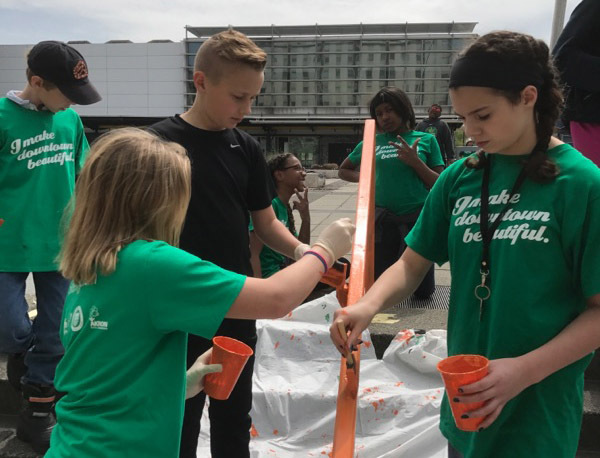 Over the course of five Fridays in April and May, more than 300 volunteers from 14 companies and organizations put a deep clean on Downtown Akron in preparation for summer with Downtown Akron Partnership's (DAP) 10th annual Green & Clean event. Tasks included mulching, painting, landscaping, cleaning, weeding and litter pick up. Visible transformations can be seen at Commerce Park, Charles Goodyear Park, the National Inventors Hall of Fame STEM School plaza, Cascade Plaza, Richard Howe House, Lock 2, the CVSR Northside Station, Quaker Square, Community Garden at Main and Mill Streets and planters along Main Street. Over the five weeks, more than 70 bags of trash, debris and weeds were collected, 80 flower boxes were planted, railings were painted, flower beds and parks were mulched, 54 flower boxes were hung and new gliders and benches were added to Commerce Park and Cascade Plaza. 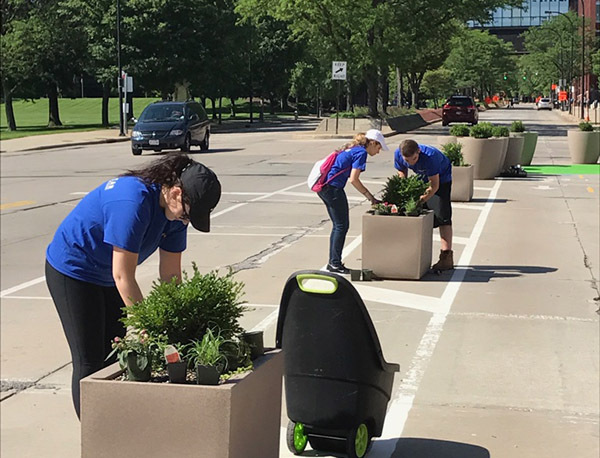 "Green & Clean projects allow volunteers to actively participate in the beautification of downtown," said Kelli Fetter, DAP’s director of engagement and events. "We work together to create a vibrant neighborhood that can be enjued all year long." Volunteers worked morning and afternoon shifts, and received a t-shirt and lunch celebration at the Barley House. A big thank you to the businesses, organizations and individuals who rolled up their sleeves for Green & Clean 2017: Akron/Summit County CVB, Allstate, Citizens Bank, Cleveland Clinic Akron General, Fallsway Equipment Company, GOJO Industries, Inc., Goodyear, Huntington Bank, Scott Lockett, McKinley Management, Metisentry, National Inventors Hall of Fame STEM School (grades 5 and 6), Pritt Entertainment Group and Summa Health Systems.